Conductor backed coplanar waveguide resonators operating at 10.8 GHz have been fabricated from Ti-Ba-Ca-Cu-O and Y-Ba-Cu-O thin films on LaAlO. 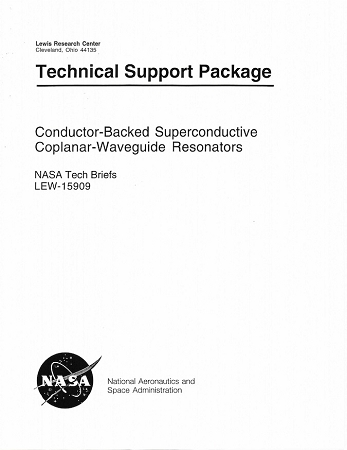 The resonators consist of a coplanar waveguide patterned on the superconducting film side of the LaAlO, substrate with a gold ground plane coated on the opposite side. These resonators were tested in the temperature range from 14 to 106 K. At 77 K, the best of our resonators have an unloaded quality factor (Q) 7 and 4 times, respectively, larger than that of a similar all-gold resonator. NASA Tech Brief. 8.5" X 11"